There will undoubtedly be times when you need to crop your videos. For example, when you got some video files with black bars on top and bottom or you want to crop videos with large dimensions to fit the small screen of devices. Please note: the software recommended in this article is for Windows, if you need some tutorial about how to crop videos on Mac, please click here. 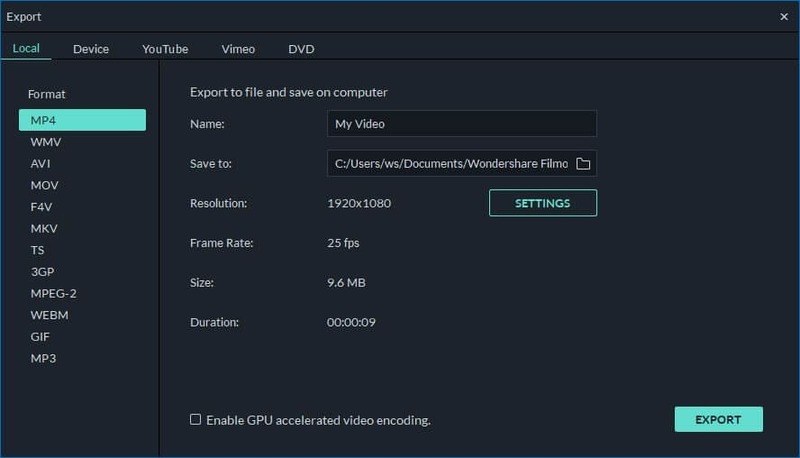 Though most video editing software would do the job, Wondershare Filmora (originally Wondershare Video Editor) is highly recommended. 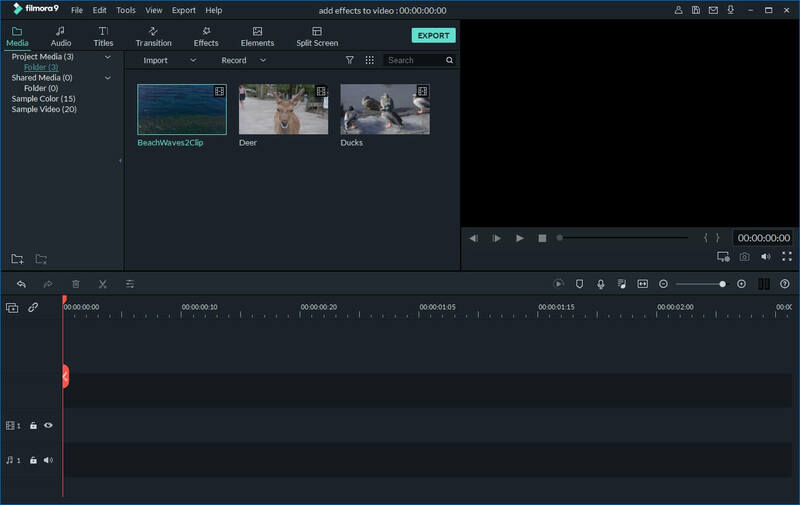 It's a powerful video editor that not only crop your video files, but also allows you to enhance the video with visual effects, transitions, titles and more. When you finish video editing, you can always find a suitable output format to generate your final result without any quality loss. Apart from that, you can also export to other options, e.g. share on YouTube or burn to DVD video directly. 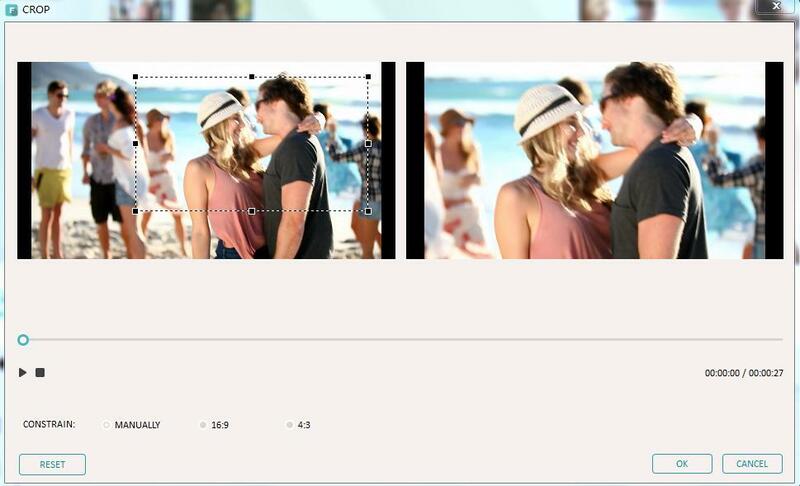 Automatically or manually crop your video into different size. Support a wide range of video formats including AVI, MOV, FLV, WMV, MKV and more. Apply effects, use filters, add titles, music and logo as you like. Export in different formats, directly uploads online or burn discs. You can either click "Import" on the primary windows and select files from your computer, or just simply drag and drop files to the User's Album before adding them to the Timeline for editing. Now drag videos from the User's Album to the video track on the Timeline and double click the video. You will find a "Crop" button in the middle of the screen (next to Return button). Click it to access the editing window to crop videos. As you can see, there are 3 options at the bottom: manually select crop area, keep the crop area in 16:9 or 4:3 aspect radio. Note that you should select a corresponding aspect radio when exporting if you have chosen a radio here. Otherwise, black bar will be generated. For example, you have cropped your video to 16:9, and then you need to set the Resolution in "Advanced settings" as 480*272 or 1280*720. When the result is OK, click "Create" to save your cropped video. You can export video in any popular formats on the local computer by choosing "Format". If you want to play video creation on iPod, iPhone, iPad, click "Device" and select the thumbnail of your devices. You can also directly upload your cropped video to YouTube or burn to DVD discs for playing on TV using a DVD Player. 1. It's always a good idea to preview your video before you export them to your hard drive. Make sure the video has not been cropped too much. 2. Make sure the aspect ratio of th ideo is the same with that of the selected output format. 3. Note that the quality of cropped video depends on the chosen output format to some extent. For example, you have selected small dimensions, but output as large dimensions of the video, the quality would not be good. In such case, smaller output dimensions are preferred.